Hubby and I are decently frugal people. We often pass on purchases that we feel we can DIY. 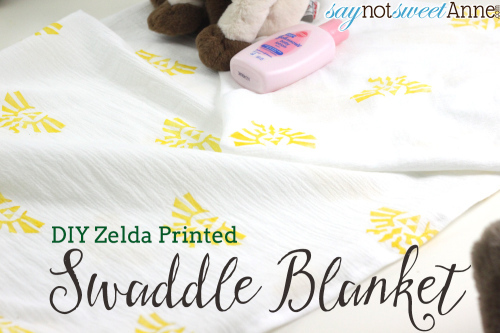 So it is no surprise that when we saw Gauze Swaddle blankets at $15 A PIECE, we decided “we can make that” and walked away. 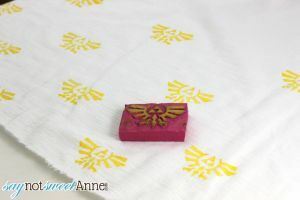 We chose to block-print our blanket in a Zelda video game theme (because as long as we’re making it, might as well make it unique!) but it would be even easier to start with some pre-printed muslin/gauze (these words mean different things in the US and Europe). 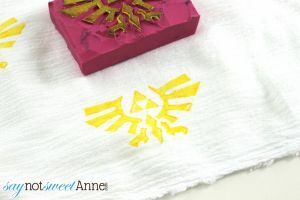 We’re total nerds and plan to have a Zelda themed nursery. The design I printed is the royal crest from the game. Flexible Fabric Paint (or screenprint ink) of your choice. 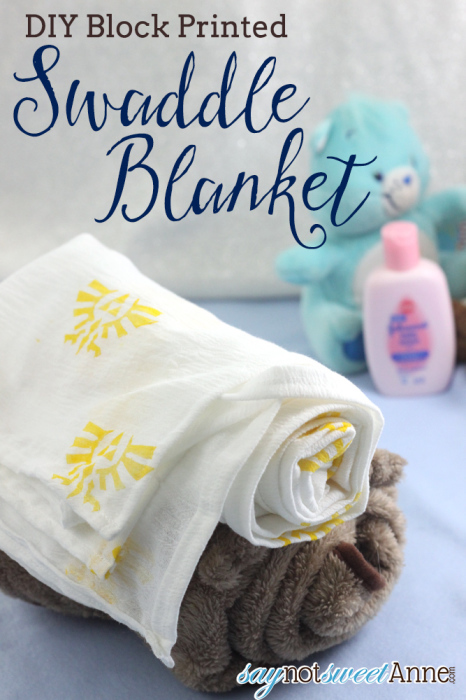 There are varying sizes of swaddle blankets, ranging from about 30 in all the way to 50. I opted to simply use the bolt length and cut it at 36 inches. Cut your fabric. You can leave the selvage edge on. Prewash it and dry without softeners. Prep your stamp by making sure it is clean and dry. 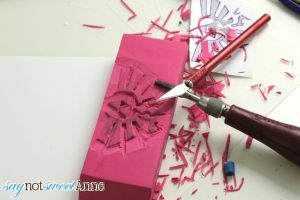 To ink the stamp you can either spread a thin layer of the paint/ink on a plate and tap the stamp in (might leave gooey edges) or use a brayer to roll the ink onto the stamp. Stamp your design. Let dry. Now for the sewing. 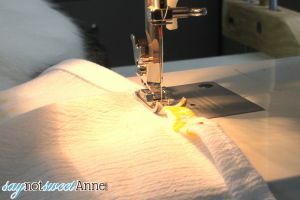 Fold each edge of the blanket in .5 inch and sew about .25 inches in. I loosely pinned mine but I didn’t iron it. 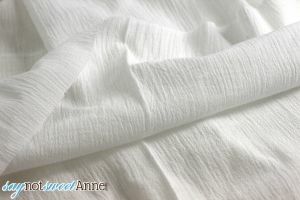 Gauze has a crinkle texture that I didn’t want to mess with. 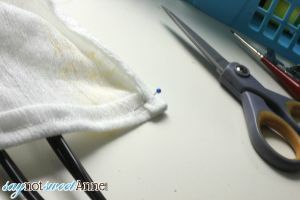 Fold the edges in once more, so that none of the frayed edge is showing. Repeat step 4 all around. For the corners, neatly overlap one edge on the other. Done! Can you believe how easy that is!? Once I got to sewing it was maybe 20 minutes. The stamping took the longest because I waited for the paint to dry every few stamps so not to accidentally smudge the designs. Sounds easy! Love DIY post! Have you tried to wash and dry it? Yes! My son is over a year old now and these blankets have seen a lot of love. 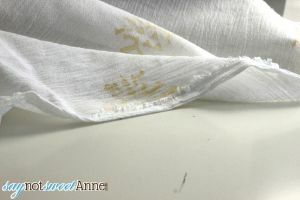 The paint doesn’t budge at all when washed, and the muslin fabric keeps its nice crinkly texture.